and the system does not reboot. I have the same issue after upgrade from karmic. Reboot ends with I/O error. Installation from LiveCD also doesn't start, because lucid don't recognize my hard drive. In earlier versions (from 8.04 up to 9.10) I used grub command "boot: pci=nomsi" - without this text busybox starts only. In lucid it doesn't matter - I/O error with this command or without it. I use Asus A8VX motherboard, Athlon 64 3800+ processor, Seagate Barracuda Sata II (ST3500418AS) hard drive and 32bit system. Update: System did reboot when I pressed <ENTER>, I had not realised it was requesting this key to be pressed. It's just mighty ugly and the huge amount of kernel messages scrolls off the screen the message telling the user to press enter. Your advice is useless for me - my problem is however not the same, and I/O error appears AFTER update, and AFTER reboot, when system trying to boot from hard drive, not LiveCD. Hovewer, LiveCD starts almost flawless, but don't recognize my disk (in gparted or palimpsest there is no disk appear at all). Installation from alternate CD starts (disk and partitions are recognized properly), but freezing when partitioning program is trying to start. 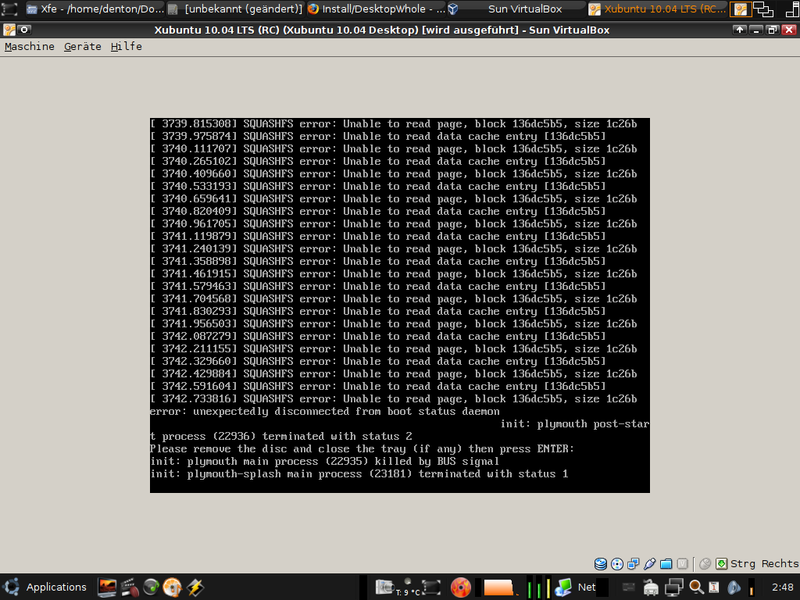 I think this is kernel or grub (rather kernel) bug - I wrote about "pci=nomsi" command, now, in lucid, it doesn't works. @ionash, your bug is completely different, I suggest opening up a new bug report. Done some other test (with another disks), and wrote new bug report (Bug #543400). I'm getting the same error sometimes immediately upon completing installation with the pre-Beta2 iso-testing build of the i386 Live CD. I've actually done five separate installs today due to another bug encountered during iso testing and this behavior is not consistent. Three installs out of the five worked fine, that is producing the expected message: "Remove CD, press enter, etc", but the other two installs were followed by a long list of I/O errors. But simply ignoring that and removing the disc, closing tray, and pressing Enter takes me through the reboot successfully. This does not seem limited to x86, or to cd installs. I see it on armel netbook image installing from a USB stick as well. I've made an effort to fix this in casper 1.231 (not yet uploaded, probably post-beta-2), but I'm not sure it will cover everything so I'm not closing the bug yet. Feedback welcome once this lands. We are seeing this in Xubuntu Lucid Beta2, lucid-desktop-i386.iso, dated 2010-04-06, also. Just wanted to mention I am also seeing this bug exactly as described using the official Lucid Beta2 Live CD. casper 1.231 is in the archive now, an will be included in the 20100410 daily build. Please test and report any results. I'm travelling this week, so not able to test this as I don't have access to the hardware. Anyone else able to confirm this fix? I won't be able to test until the nvidia/nouveau bugs are resolved. My LCD monitors are now locked at 800x600 maximum resolution, and everything is blurred. Okay, thanks to the suggestion on another bug to blacklist vga16fb and nouveau, I was able to install nvidia hardware drivers and get my high resolution lcd back. Installing using the Xubuntu image dated 2010-04-10, lucid-desktop-i386.iso, results in the same messages after the installation. There is no change in that. However, I did get several other text messages, including "checking for unattended-upgrades" after the installation completed but before the I/O Error messages filled the screen. Now testing the Ubuntu 386 image for 2010-04-10 to see if the results are different for that. Errors still happening using the Ubuntu Desktop 386 image, lucid-desktop-i386.iso dated 2010-04-10. It has changed a bit with this image. Now, I can read all the messages on screen, and the message "Please remove the disc and close the tray (if any) then press ENTER: " appears before the I/O errors. I only have 10 of the I/O error messages appearing on screen. It no longer fills the screen. Problem is still present for me also using today's daily. "apt-cache policy casper" reported ver 1.231. This is still happening testing the pre-RC images on a 386 system. Confirming importance set to medium, removed beta from summary. I can also confirm this on the pre-RC i386 image, but it's not consistent! Three out of four installs worked as expected, only the fourth failed with the I/O errors. But also simply removing the disc and pressing enter continues as though all is well. So IMO it's largely "cosmetic". * I can confirm this the same way charlie-tca did when testing. I used Xubuntu daily (20100419), casper 1.236. * After clicking on restart now Xfce shuts down and you drop to the tty where you see daemons stopping, etc. * In the end (before the actual reboot) I receive dozens of these I/O errors (screenshot attached). * Installation from LiveCD was not affected any further. * Could this rather be a problem in plymouth? The bug is still present. Removing the disc and pressing enter reboots the system. In spite of that bug the system was instelled successfully. This bug still exists with the first Lucid pre-final iso-testing i386 Live CD 04/26 early PM in the states. Specifically I get a full screen vertically of I/O errors with no prompt to "close tray" and/or "press enter" to proceed. If I do remove the CD, close the tray, and press enter all goes ahead as it should but a noob won't know that. So, if this can't be fixed, it must at least be prominently addressed in the release notes. Otherwise the install was flawless. Once again this is not consistent behavior. That last test was "entire disc". I followed it with an "auto-resize" and had the same behavior. I followed that with a manual partition installation and got the normal notifications. Totally inconsistent! Impossible to nail it down to a specific installation scenario! I certainly don't envy you at this point, I'm clueless as far as what else I could attach to the bug report to be helpful. I've opened a release notes task for this, as we're not going to be able to make any sufficiently reliable improvements at this point to be able to guarantee that this goes away entirely. A lot of this presumes you have a CD eject which lets you know the installer is finished. When I installed from a USB drive on my Dell Mini 9 and got the I/O error I had no indication that the installer was finished. It happens when the disk gets ejected... (slimline tray drive in my case). As other people said, it's not a big problem as long as you know that you're supposed to remove the disc, close the drive and press enter (like most people used to ubuntu installs), but for ubuntu noobs it's gotta be scary. In my case (official 10.04 Ubuntu desktop disk), I get these "end_request: I/O error, dev sr0, sector 506112...606172 (the last ones visible on screen)" messages after CD has been ejected. Pressing Enter on this state does not reboot the system, I have to press the reset key. Also Ctrl-Alt-Del does not work (maybe it even should not work). I tested this three times (i.e. installed the system three times). The same error message was given on all times after CD was automatically ejected and Enter did not reboot the system in any of these. I'm sure it comes as no surprise but thought I should report anyway, this behavior still exists iso-testing the pre-alpha 1 Maverick i386 Live CD. I could confirm this one too. I've seen this error on multiple different Systems (x86, amd64). At end of install, I get errors like "end_request: I/O error, dev sr0, sector 437628". I remove CD, press Enter. Nothing happens. I h/w reset the PC. During last install attempt, "grub rescue>" prompt showed up. Please fix this problem. It's time to fix it. Fabio: the portion of the bug fix-released is to have this included in the release notes. The bug itself has not been fixed. This probably needs to go again in the Maverick release notes as it's still the case. I tested this on the latest Maverick daily (today),, i386 CDROM, I was able to reproduce it. I also tested from a USB key, didn't get the errors. I had to Alt > SysReq > b to reboot. It was otherwise just hung. But that's only happened once out of three trials. Also noted at <https://wiki.ubuntu.com/MaverickMeerkat/TechnicalOverview#Boot,%20installation%20and%20post-install> — thanks. In the "Known Issues" section of https://wiki.ubuntu.com/MaverickMeerkat/ReleaseNotes , this issue should not be listed twice. > not be listed twice. I'm setting this bug report to Won't Fix as there have been no reports of this since Maverick (10.10) and we are currently developing the 12.04 release of Ubuntu.